Giveaway Checkers, also known as Losing Checkers, Suicide Checkers, or Anti-Checkers, is essentially "checkers in reverse". The object of the game is to get rid of all of your pieces first (or be blocked). You do this by forcing your opponent into captures. 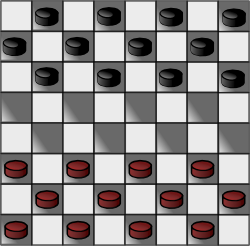 Gameplay is otherwise the same as Standard Checkers rules. The game is of relatively limited scope. Opening play is almost entirely concerned with luring or forcing and adverse piece to square 14 or 19, whence it can be forced to jumpt to 21 (by Black) or 12 (by White). So although the game makes for an interesting Checkers variation in its own right, it's greatest value might just be in making you look at the game from a new perspective, clearing your head of familiar patterns, and forcing you to appreciate the original game anew.